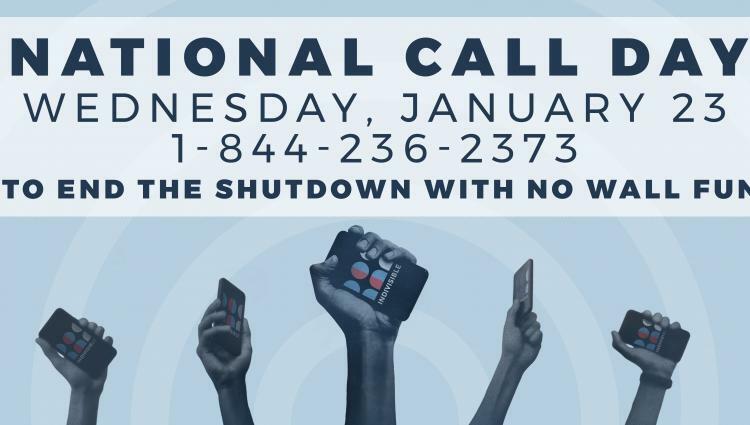 Wednesday, January 23 is a National Call-In to End the Shutdown. Two votes will come up in the Senate TOMORROW. One moves forward Trump’s xenophobic agenda. The other is a clean continuing resolution (CR) that reopens the government for discussions on border security without government workers being held hostage. Call your Senators TODAY and urge them to vote tomorrow for the clean continuing resolution to reopen the government. Sign up for a call shift TODAY to contact constituents in key states with GOP Senators, urging them to contact their Senators about voting for the clean CR tomorrow. If the clean CR fails, we ask you to write a Letter to the Editor (LTE) calling for a clean end to the shutdown. FRAME FROM A POSITIVE MORAL BASIS. EMPHASIZE AMERICAN VALUES. The purpose of government is to serve the people, not cause harm to the people. This is the Trump shutdown, and now he is holding federal workers and American citizens hostage, causing real harm and suffering to employees, contractors, and citizens needing services. The House and Senate already passed a bill to keep government running in 2018; Mitch McConnell should reopen government and then hammer out details of a smart and effective immigration plan. Democrats want safety for all Americans, with smarter, better, and more cost-effective methods for border protection. Trump said on TV he was proud to shut the government down. It is wrong to hold the nation hostage and harm all of us. We don’t negotiate with hostage takers. The Senate has to do its job. It is a co-equal branch to the president, not subservient to the president. The Senate passed a bill to fund government in December. It is up to Senator McConnell to pass a bill to fund government. 800,000 people are not getting paid and services are not being provided to American citizens. The unpaid workers lives are being devastated and our health and safety is being put at risk. The economy is suffering, hurting all of us. Trump makes this about Democrats and Republicans. That’s not what this about. All Americans want smart and effective immigration policy. Border protection yes, with proven, effective, and cost-efficient methods. Nearly 10,000 Oregonians are federal employees who are not working or working without pay. These are our friends, our neighbors, our families. Locally in Clatsop County, consider the Coast Guard, putting their lives on the line every day to protect us, and they are not getting paid. They should not be held hostage by President Trump. Our nation deserves better than a Trump shutdown that harms our neighbors and families. House Speaker Nancy Pelosi and the Democrats joined by a number of Republicans in the House of Representatives have passed bills to reopen the government. These are the same bills passed by the Senate at the end of 2018. Yet, Senate Majority Leader Mitch McConnell (R-KY) has now refused in this new Congress to allow the Senate to vote on the newly passed House bills to reopen the government. This is because trump has said he will not sign any bill to reopen the government that does not include $5.7 billion towards the building of a wall across our southern border. Under our constitution, Congress is supposed to be a co-equal branch of government with the president and the courts. Our founders had the idea each branch would be a check on the power of the other branches. But under Senate Majority Leader Mitch McConnell (R-KY) the Senate has given up its role as part of Congress that acts independently and as a check on the president’s power. McConnell’s Senate is little more than a mouthpiece for trump. McConnell forces the Senate to follow trump’s direction. McConnell has given up to trump’s control the Senate’s responsibility to act as a co-equal but separate branch of government. McConnell is not listening to the voters, only to trump. The shutdown is deeply unpopular. The voters don’t want government shut down as a way to determine public policies. The Democrats’ position is simple and is exactly what most voters want: Reopen the government and then discuss and debate policies like border security. Trump has the idea he can do what he wants, even shut down the government to get his way. That’s not the way it’s supposed to work. Policies that may become law are supposed to be debated within an open government. The president is not supposed to get his way all the time. If he did, that would make him a dictator. Congress, elected by the people, is supposed to have a role in deciding government policies. The process of passing legislation is supposed to happen in regular order during an open government with full debate and a vote by every member of Congress. This is what our founders envisioned. Even when the Republicans controlled the House of Representatives in the first 2 years of trump’s presidency, they didn’t approve funding for a costly and unnecessary wall across our southern border. Trump didn’t shut down the government then. Why is he shutting down the government now that the Democrats control the House of Representatives? Why is he now hijacking the government allegedly over a southern border wall even House Republicans wouldn’t give him for 2 years? It’s clear this is nothing more than a distraction from the real possibility the House of Representatives will seriously investigate trump’s business dealings with Russia, his possible violations of the Foreign Corrupt Practices Act, his ties to Putin and Russian oligarchs that may have put him in office, his purported role as a Russian agent or at least “useful idiot”, his refusal to condemn the Saudi Arabian’s government’s role in the torture and murder of a Washington Post journalist, his acceptance of monies from foreign governments and officials in violation of the emoluments clause, his alleged money laundering, the bribes, the treason. Trump has always stirred up fear with racism and xenophobia particularly directed at people from south of the border. What better distraction from his criminal past and corrupt presidency than a government shutdown over a wall he claims will stop “caravans” of terrorists, drug couriers, and generally undesirable “illegals” from south of the border? 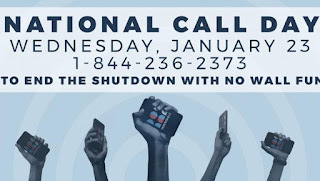 Trump’s shutdown has created a crisis for hundreds of thousands of federal workers and their families as well as for those who work under government contractors and business owners who depend on government workers as customers. The trump shutdown has highlighted the great income inequality in America. 63% of Americans don’t have enough savings to cover a $500 emergency. 26 people in the world own as much as the poorest 3.8 billion. The richest 1% in the U.S. hold nearly 40% of all wealth in the U.S. The bottom 90% hold nearly 75% of all the debt. It is no surprise that as families of furloughed federal workers face a second month with no pay have run out of money. Some are looking for jobs to tide them over, but many are forced to work with no pay and have no time to look for let alone work at a second job. They are forced to turn to food banks and rely on donations for food. More than that, they can’t make copayments for doctor visits or medications. For those required to work with no pay, there are child care and transportation expenses they are struggling to pay. They can’t pay school tuition and other expenses for their children. Though many mortgage companies and landlords have said they will accept late payments, how long will they really wait? For those employees of government contractors who have lost jobs and business owners shuttered because of the shutdown, there will be no back pay. People with disabilities and elderly and others who depend on government funding for housing face eviction if trump’s shutdown does not end soon. It’s been well-established that a border wall will do nothing to stop the flow of drugs into the U.S. Most drugs are transported through ports of entry including. There are simply not enough agents and equipment to search everything that is transported through ports of entry in container ships, for example. Also, most people here illegally have overstayed a visa. A border wall will do nothing to change that. Also trump has left unfilled thousands of border patrol positions. If there is such a crisis at the border, why not fill these positions first?